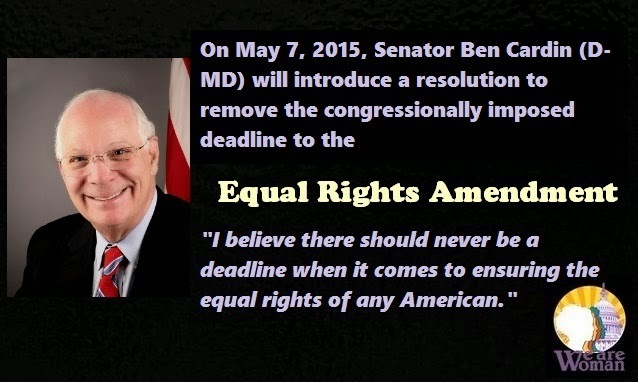 Home » Ben Cardin » equal rights » Equal Rights Amendment » Remove The Deadline From The Equal Rights Amendment! Remove The Deadline From The Equal Rights Amendment! Senator Ben Cardin of Maryland is introducing a Senate resolution to remove the deadline from the Equal Rights Amendment. Once removed, only three more states are needed to enshrine gender equality into the United States Constitution. The Equal Rights Amendment (ERA) was originally written by Alice Paul and Crystal Eastman. In 1923, it was introduced in the Congress for the first time. In 1972, it passed both houses of Congress and went to the state legislatures for ratification. 35 states ratified it - a deadline was attached and the deadline expired in 1982. 38 states are needed to add an amendment to the Constitution. Did you know that the 27th Amendment, dealing with congressional compensation was originally proposed on September 25, 1789 and ratified on May 7, 1992? That’s 203 years! No deadline for that one, but constitutional protection for women? The Equal Rights Amendment got ten years, and then it was game over. Contact your senators and tell them you want them to support removing the deadline. Spread the word. Make them feel the pressure. Be friendly and courteous but be firm!!!! There is NO VALID ARGUMENT against gender equality.